In our last post, we took the time to highlight some of our strengths here at HiCrest Restoration & Clean. Whether you had a house fire, have water damage from a burst pipe or a flooded basement, have a serious mold issue and require professional mold removal, or even need sewage cleanup from terrible storm damage, we here at Missoula’s top restoration company can help. With affordable pricing, a commitment to doing right by our neighbors in the community, and an unmatched level of expertise, you can call us 24/7 if you are in need of emergency restoration services. Likewise, we are experienced when it comes to commercial restoration projects. Our professional disaster remediation technicians are 100 percent certified to clean your property. Whether you’re looking at local carpet cleaning services or need emergency sewage cleanup on your commercial site, we’ve got you covered. We fully understand that there is no room for error at all when it comes to a burst sewage pipe or the like. That’s why you can’t have just anyone clean up your office building or industrial complex. There is a right way and are a whole lot of wrong ways to go about damage repair. For starters, you need a completely insured, certified, and licensed professional to put an actionable plan together. We will do exactly that at HiCrest Restoration & Clean, which is why more and more people are choosing us as their sewage cleanup company in Missoula. As fun as it is to (accurately) toot our own horns, our readers were promised a post about choosing a home restoration company, and by golly, that’s what they are going to get! With that in mind, keep reading if you are interested in gleaning some helpful tips the next time you need Missoula damage repair on your residential or commercial property. While we are certainly biased when it comes to who we think you should choose for home and commercial restoration services, we can still offer you some industry-savvy advice. Even if you don’t live in Missoula, or Montana, for that matter, we recommend keeping some of these tips in the back of your mind, because you never know the next time you’ll need to quickly decide on a home restoration contractor! We digress. Read on for some practical tips from your local disaster restoration company of Missoula. Let’s start with some warning signs when it comes to choosing a restoration company. A noticeable lack of paperwork or attention to detail is a very bad sign. Attention to detail is somewhat vague, but most people know it when they see it. A tell tale sign of a poor restoration company is that they don’t follow through and aren’t voluntary when it comes to requests for information. What kind of information? 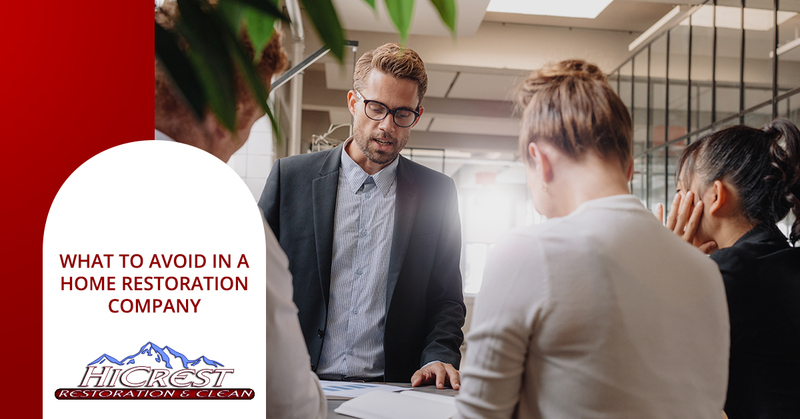 When the restoration contractor comes out to give you an estimate for the project, ask them for copies of their bond and insurance paperwork and contractor’s license. We also recommend that you request a formal, written estimate that can be included in the work contract. And look, we get it, when your home has flooded or there has been a disaster of some kind, your impulse might be to gloss over some of the details. But trust us when we say you don’t want to count yourself as someone who has a disaster restoration horror story to tell their friends. Fight the urge to cut corners, even if the company you are using gives you a bit of pushback. If they do, it’s a good sign that you should get another bid on the project. Don’t let a restoration push you around just because you are in a vulnerable situation. If the restoration contractor you are considering gives you an over-the-phone estimate, you might want to think twice. Assessing the damage of a property is always a case-by-case situation, so don’t be tempted by someone who sloppily throws out a figure when they have no idea what they are talking about. That’s just a cheap sales tactic. Again, we understand the attractiveness of selecting the company that can get to your cleanup project the soonest, but that isn’t the only criteria you should be using to make your choice. However, at HiCrest Restoration, we don’t make you choose between quality and haste. You get the best of both worlds with Missoula’s top home restoration company! When things go wrong at your home or place of business, the impulse is to get the problem solved as immediately as possible. Psychologically, this makes sense. Your fortress, your safety, security, etc., has been compromised. If our readers are familiar with Maslov’s hierarchy of needs, the psychological need for shelter is foundational. It is in the same category as our base instinct for food, water and basic safety, for reference. Our point is that we have a biological drive to fix the problem with your home or commercial property. With that in mind, do not let an untrustworthy restoration company take advantage of that susceptible state you find yourself in! If the opportunistic contractor you are doing business with demands a downpayment that is suspiciously high, get another quote. If that contractor offers you a cash discount if you hire them on the spot, get another quote. While we aren’t trying to employ scare tactics here, it’s not unheard of for a shady restoration company to disappear in the middle of a job, or perhaps never start at all. We hope that you’ve found these recommendations for avoiding nasty contractors helpful. Keep an eye out for a future post where we will highlight qualities to look out for in a residential or commercial home restoration company. But for now, we at HiCrest Restoration & Clean will continue to work to restore your home to its pre-damaged condition as quickly as possible. But, again, timeliness is not the only factor we consider when performing cleanup on water damage, smoke and fire damage, true carpet cleaning, and/or mold removal. We are the top rated local restoration experts for a reason; we blend quality with value and efficiency. All our team members are 100-percent certified and we are just a phone call away from being there if you need us should an emergency arise. But even if there is a time-sensitive emergency, we will not compromise our standards. We are part of the Missoula community, and with that fact comes our commitment to doing right by our neighbors. If you want to do business with a stand-up company that has experience and industry-knowledge like no other contractor around, contact us today! We’d love to help solve your problem.